Arrow Inks provides low energy UV curable formulas that utilize the latest technology to provide rapid curing at low energy. With less lamp power and equipment required the printer has more media options and faster production speeds. Our UV, LED & Hybrid inks are made in the USA with the finest quality ingredients and tightest tolerances. Arrow Inks packs immense color per drop with ultra reliable jetting characteristics and our formulas can be customized to meet your application needs for color, adhesion, climate resistance, and other unique business requirements. Arrow Inks provides replacement inks for use in DoD Printers. Our customers are very satisfied with Arrow product performance, speedy delivery, cost savings, and fantastic customer service. Customers are currently using Arrow Inks with thier Atlantic Zeiser™, Buskro™, Domino™, DPI™, GT™, MCS™, and Kirk Rudy™ printers. 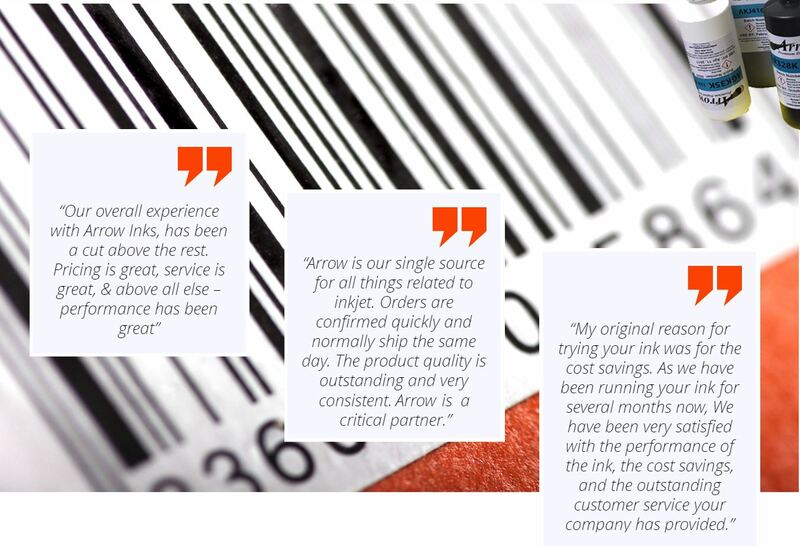 Arrow Inks are manufactured with the finest raw materials specifically compatible with the print head assemblies used in each printer, allowing for a compatible ink with long nozzle open times, fantastic barcodes and adhesion over a wide variety of substrates. Available in various packaging options and volume sizes to fit your ink delivery system and printing requirements. Arrow Inks are in health and environmental compliance with REACH, prop 65, and CPSIA.